We took the same great fabric and design features of our Double Thick Pullover Sweatshirt but pared down the weight by removing the inner layer of fleece. Our single thick, 12 oz. 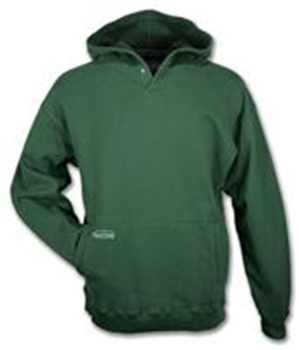 100% pre-shrunk Cotton Fleece wonder is sure to serve you well on those slightly less chilly days. In addition to gusseted armpits and snap closures at the neck, an oversized hood fits comfortably over your hardhat and gives you that grim reaper look that makes nature very nervous.